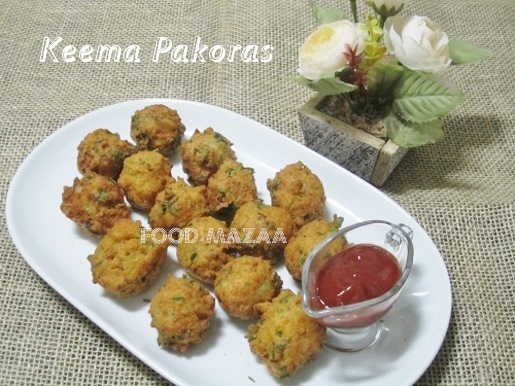 Pakoras are relished by one and all specially on a rainy day. Have you ever tried making them with mince meat ? If not you must give it a try. I have used chicken keema in this recipe.. you may use mutton keema or minced beef also. Vegetarians can replace it with soya granules. We can make use of the left over keema also. Take care while mixing the batter and add the water according to the consistency of keema. 1. Mix all the ingredients together (except oil) adding a little water to make a thick batter. 2. Heat oil in a kadai / frying pan. 3. Drop small quantities of batter and deep fry until crisp and golden brown. 3. Serve with chutney or sauce. Me too follow the same way. But never added mint leaves in it. Will try your version. Very inviting click. Feel like grabbing some and having rite now..Irresistible fritters. Delicious and healthy ones Shobha..Indulge with steaming tea...yum! best at tea time ! yummy....easy 2 make n tasty 2.. I love Indian kitchen. I must try this recipe!